Most of us have read to youngsters - children, grandchildren or even great grandchildren - perched on a knee or sitting at our feet. But the Rotary Club of Dargaville, NZ is reversing the traditional role and each Wednesday up to a dozen members go to Selwyn Park School where the children read to them. 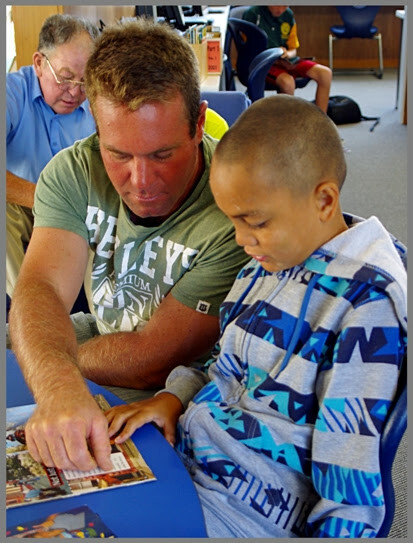 Students at this lowest Decile 1 primary school, who have been identified as would benefit from extra reading practice, pair off with the Rotarians in the school library and spend 45 minutes reading to them from journals and books matched to their abilities. The project was the brainchild of Rotarian Colin Patterson who has since moved to Kaikohe where the local Rotary club is benefiting from his enthusiasm. It began at the start of the last school year and the children's enthusiasm as they wait for their Rotarian, and during reading, indicates they are really enjoying it. Also, both Rotarians and teachers report a boost in the youngsters' reading ability and confidence, and test at half-year showed that all had improved - some by 1.5 years of reading ability. As a result the programme is likely to be ongoing. Dargaville Rotary President Brian Burnett has no doubts about the value of this programme. "The pleasure we have seen in their faces as they read - and understand what they're reading - has been our greatest reward," Brian said. Selwyn Park School Principal Vern Stevens agrees. "It has made a huge difference to the kids who really look forward to Wednesday's reading," he commented, "and so do the teachers because the children come back to class buzzing." Dargaville Rotary has always placed strong emphasis on youth, participating in both year-long International Youth Exchanges and the shorter Rotary Australia-New Zealand Exchanges, hosting the annual Northern Wairoa Primary School’s Speech Contest, providing tertiary scholarships to deserving students and offering local young people a variety of opportunities, like Road Safety Education (formerly Rotary Youth Driver Awareness) to further their life experience and education. The Rotary Club of Dargaville was also the major sponsor for the Careers Expos organised by Kaipara Employment For Youth which aim to match school leavers with work in their own district.